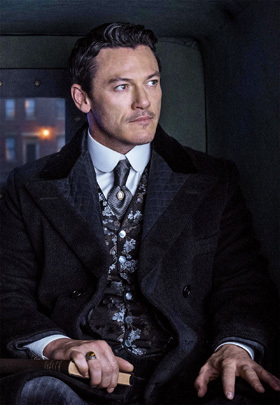 My primary recollection of Caleb Carr's novel The Alienist, which I read fifteen years ago, is thinking a screen adaptation was inevitable. 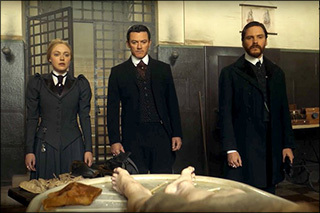 Set in 1896 New York City, with a team of investigators using pioneering methods to identify and capture a serial killer preying on juvenile male prostitutes, it played with the "birth of criminal profiling" conceit and played upon readers' familiarity with modern forensics as these mavericks work outside a corrupt and hidebound system. The characters were sketched in broad strokes, but the historical backdrop, period detail, and mix of real-life and fictional figures gave the proto-procedural premise a compelling hook. It seemed destined to be a movie. Instead, it was developed by writer/producer Hossein Amini (Drive) as a ten-part cable series for TNT. Daniel Brühl is psychiatrist Dr. Laszlo Kreizler, a student of Freud and the alienist of the title. (Each episode opens with the reminder: "In the 19th century, persons suffering from mental illness were thought to be alienated from their own true natures. Experts who studied them were therefore known as alienists.") Summoned by New York City police commissioner Theodore Roosevelt (Brian Geraghty) to consult on the gruesome murders of young boys, Kreizler recruits his friend John Moore (Luke Evans), an artist and freelance journalist, as an assistant and field agent, and gathers a team that includes police pathologists Marcus and Lucius Isaacson (Douglas Smith and Matthew Shear), Jewish brothers sidelined by the Irish old boys' club, and Roosevelt's secretary Sara Howard (Dakota Fanning), a sharp mind overlooked in the chauvinistic force. It's a familiar set-up for an interesting if not terribly original mystery, with the usual blind alleys and official obstructions. Brühl's Kreizler is the dour humanitarian whose brusque manner covers his own psychological baggage and Evans' Moore rebels from his silver-spoon life with the company of hookers. They are a warped Holmes and Watson team without any real sense of history or devotion, while the romantic dance between the lady-killer Moore and the wary Howard is routine. But it all plays out on a glorious recreation of late 19th-century New York City, the show reveling in the culture of political corruption and high society hypocrisy as well as the squalor of the homeless boys reduced to dressing as girls for the street trade. It's both appalling and fascinating, a part of the culture of poverty and social neglect that Dickens never broached in Oliver Twist. There's a gleefully sordid quality to the proceedings and the characters are more interesting when working as a team than as individuals dealing with their own issues (and yes, they have plenty). The show bucks at least one convention: the investigators solve the mystery of the killer's identity in a satisfyingly methodical manner well before the final episode. The challenge is to find this character before the next murder. And just like the novel, it leaves room for a whole series of cases to follow.